Celebrate Dia de Muertos with food, music, live performances and family fun activities. Join us for our 8th annual celebration of Latin American culture with activities for children and adults alike. Evergreen's Day of the Dead celebration takes place at the Sunday Artisan Market and incorporates traditional Latin celebrations, fun family activities and delicious food and drink. At Day of the Dead, you can enjoy live music and traditional dances on our main stage as part of the Sunday Performing Arts Series, Presented by Bank of America Merrill Lynch, understand the ritual of creating an altar or “Ofrenda,” and listen to storytelling by Catrinas, which are an essential part of the Day of the Dead celebrations. Our Sunday Artisan Market will merge with our Latin Mercado, where we are featuring chefs and artisans from the Latin community. With food, fun and shopping, there will be something for everyone. Come join in the party! New this year: Cross-Cultural Exchanges. We are creating a facilitated space where people from diverse backgrounds can have conversations about the importance of rituals, food, culture and diversity. Let’s celebrate Dia de Muertos together! Our Sunday Artisan Market welcomes the addition of Mexican & Latin American street food. As the weather cools down, we are excited to spice up those pre-winter blues. Tamales, carnitas, Esquites (white corn soup), Atole (corn hot beverage), Churros, Nopales & salsa picante are just some of the things you might find. Drop by el Mercado to celebrate Latin food produced with local ingredients! We will be featuring a special beer brewed with foraged ingredients from Irene of Tibo Teas, as well as two special Tequila-based cocktails at the Sipping Container. Ofendas are an essential part of the Day of the Dead celebrations. The word ofrenda means offering in Spanish. They are also called altares or altars, but they are not for worshipping. Ofrendas are set up to remember and honour the memory of their ancestors. As we assemble our ofrenda you are encouraged to bring offerings that remind you of those dear to you that have passed away. 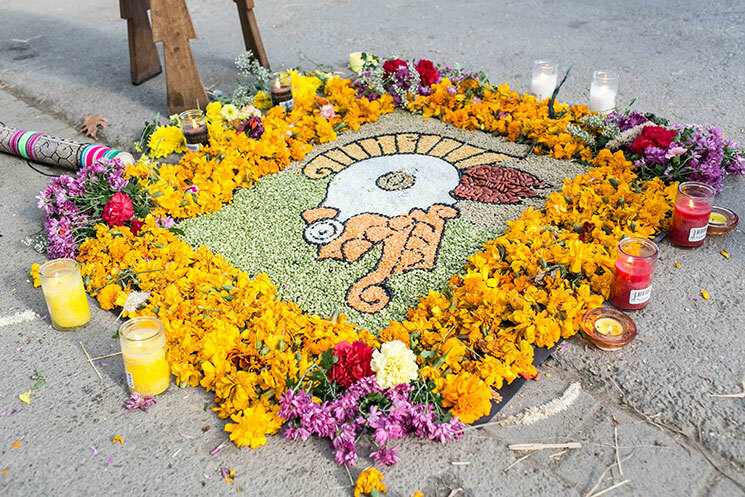 This can be their favourite foods, objects, beverages, photos or flowers, especially marigold flowers called “cemoasúchitl,” as they represent the fugacity of life. Our Pavilions will be buzzing with an exciting array of music, dance and storytelling. Curated by Casa Cultura Mexicana, these performances bring communities together by creating something big through the arts and sharing our customs to this multicultural country. The performances are the final installation of the Sunday Performing Arts Series, Presented by Bank of America Merrill Lynch. We strive to contribute to our society by educating our communities artistically and to make our society feel proud of living in a country where all cultures are welcome. We celebrate the richness of cultural diversity within the society and reaffirm community and culture. The Mexican Folk Ballet is a dance group dedicated to showing the folklore of all Latin-American countries. Their seniors group has been established in Toronto for more than 8 years under the umbrella of Davenport Perth Community Health Centre and now under the direction of The Mexicans Folk Ballet. The group is supported by Ontario Arts Council and Toronto Arts Council. Elisa de la Torre (known as Partylicious Mama or #ThatMexicanMom) is a publicist, businesswoman and entrepreneur, originally from Mexico City who loves to entertain kids and families. Her work has been broadcast numerous times on local shows, airing on Canada’s Rogers TV as well as The Toronto Star and The Global and Mail among others. With her entrepreneurial spirit and knowledge acquired in the past years she loves to empower anyone including children to believe in themselves and go after their dreams and purposes. The Mexicans Contemporary Dance Company is a company of Mexican Dancers, exploring new ways to move across eclectic training and performance arts. On this occasion, they present “Alebrijes” a strange mixture of the animal world that emerges of exploration the desire to possess what is needed. 12:30pm | Grupo latinoamericano de musica "Cascabel"
Mexico Amigo has performed at such venues as the Royal Ontario Museum, the Canadian National Exhibition and Harbourfront. They have also performed at the WOMAD Festival, the International Hispanic Festival, and the annual Mexican Independence Celebration at Nathan Phillips Square for more than 20 years. They were named as TORONTO'S BEST MARIACHI BAND by Toronto Life Magazine. The Mexicans Folk Ballet is a Mexican dance company established in Toronto since 2012 under the direction of Jorge Zarate Tristan, with the main purpose of share and promote Mexico’s culture, traditions and folklore through dance. Their work is based on the cultural heritage of Mexico, and how they can enrich and share it with the Canadian and international community. The Mexicans Folk Ballet is a dance company recognized and supported in their activities by Canada Council for the Arts and Ontario Art Council. Toronto Art Council also has collaborated in several festivals and events for the culture and diversity in Toronto. The Mexicans Folk Ballet have taken their art and dance abroad, participating in several International Folklore Festivals in countries like Spain, Nepal, Greece, France, Peru and China. Join us as we celebrate Dia de Muertos in the Children's Garden with our traditional altar to the animals of the Lower Don. Learn about the various animals that live in our watershed while exploring wood-fired cooking. Learn more about Weekend Nature Play. Drop by our face-painting booth and be transformed into a calavera (skull) for the celebration! La Catrina has become the referential image of death in Mexico, and it is common to see her embodied as part of the celebrations of Day of the Dead. Learn how to make these beautiful flags and take home your unique creation. See and learn about traditional designs that decorate a sugar skull, and create your own from provided paper templates. Drop by the brick oven and learn about, taste and purchase the best Pan de Muerto Toronto has to offer, freshly baked by expert baker and owner of Pancho’s Bakery Señor Adalberto Aguilar Lopez (Padre). Join chefs, bakers and experts in an intimate conversation about food, culture and celebrations. Learn from expert Chef Baker Aguilar how to make Day of Dead bread and its cultural significance during the celebration. Space is limited so please click here to register by Monday, October 22, 2018. If spaces are full, please email publicmarkets@evergreen.ca to get on the waiting list. Cost: Recommended donation of $5 or pay what you can. Taste through 3 different mezcals and learn from Yvette Astorga, founder of Mezcal People, as she recalls stories that connect mezcal with the Day of the Dead. Spaces are limited so please register in advance. If spaces are full, please email publicmarkets@evergreen.ca to get on the waiting list. Cross-Cultural Exchanges is an open space created for conversation between people of different backgrounds. We often go to a cultural event, have a great time and want to learn more about the traditions behind it. At this event, we have intentionally created a space for dialogue between different cultures. Hosted by a member of the Mexican community, participants will use food, art and dialogue to learn more about Day of the Dead rituals, Latin American culture and how this festival is a way for people to cope with the loss of loved ones. Education Programs Advisor, Latin American Liaison & Senior Facilitator for Mindfulness Without Borders. Ronit facilitates education programs to youth and professionals in Toronto and Internationally. Born in México, she is fluent in Spanish, English and Hebrew and enjoys a diverse academic background in literature, performing arts and Gestalt Therapy. Ronit holds a Master’s degree in Environmental Studies from York University with a special focus on social transformation. She is the founder of The Living Room Practice Community, a meditation-instruction and community-building experiment going into its fifth year. A long-time mindfulness practitioner, Ronit’s teaching style focuses on generating community by weaving together the old and the new, namely the blending of Buddhist thought and practice with emerging forms of social engagement and community building. Ronit’s passion is fueled by her unwavering belief in human beings' capacity to awaken from the dream of anthropocentrism into the reality of interdependence. Ronit loves to write, cook, share meals with friends, ask questions that bring people together and give form to seeing the world through a different lens. Traditionally in cities and homes across Mexico, families and friends come together on the days leading up to the Day of the Dead celebration to plan and build the altar or "ofrenda." This is done to honour a person that has passed away. This annual ritual of collective or community remembrance makes the concept of death easier to overcome. New this year at Evergreen's Day of the Dead celebration, we are partnering with Casa Cultural Mexicana and inviting the Mexican community to come and build their "ofrenda" at Evergreen Brick Works. We hope this partnership will help share this tradition not only with the Latin community but Canadians more broadly. If you are interested in this opportunity please e-mail Jorge Zarate Tristan at zaratetristan@hotmail.com and he will provide the bases for participating. This event would not be possible without the help of our community partners: Casa Cultural Mexicana, ChocoSol Traders, Exatec, Maizal, Mezcal People, and Pancho’s Bakery.